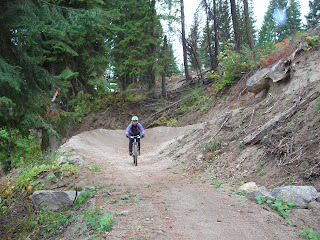 Tamarack Resort is a new all-season destination resort about 20 minutes southwest of McCall. Nestled at the base of Tamarack Mountain, overlooking Osprey Meadows Golf Course and Cascade Lake, it really does have a lot to offer. Winter brings plenty to do with downhill and nordic skiing, snowboarding and snowshoeing, but summer is where it differentiates itself. 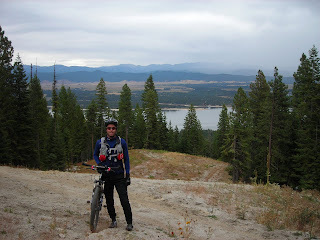 Lake activities, golf, lift-served mountain biking, zip-line, hiking, disc golf, amphitheatre...are you tired yet? There will soon be a Fairmont Hotel on site, as well, with Andre Agassi and Steffi Graf partnering on that project. We're talking high-end property, folks. They even greet you with chocolate chip cookies! 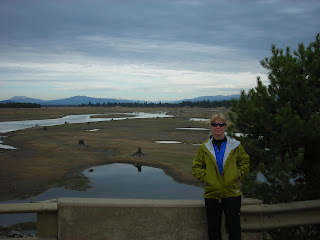 We were a little fatigued from our previous big day in McCall, plus dreary weather had set in, making it doubly difficult to get motivated. But, we rallied, packed several layers and hit it. I know you'll all be surprised, but we chose mountain biking as our activity for the day :-) If it had been another bluebird day, we probably would have opted for some sort of water pursuit; there's always next time for that. $25 gets you an all-day lift pass for 12 miles of downhill mountain biking, and several people were utilizing that service. But, being the endurance crack-heads we are, we had no choice but to pedal up the 2,000 feet using our legs rather than the lift. The downhill is so much sweeter when you earn it, not to mention how much better dinner tastes after some true suffering. 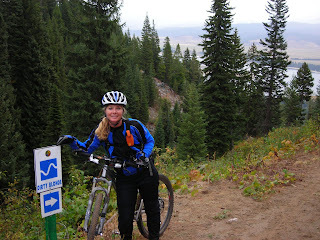 Joanne prepares to ride the "Dirty Blonde" trail...'nuff said. We felt so charged after descending the mountain on trails like Pura Vida, Apollo and Show Low - complete with banked turns and just enough obstacles - that we wanted a little more. 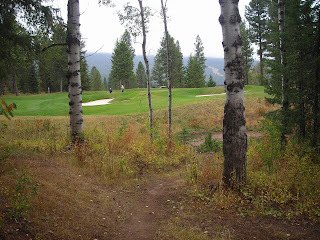 Hence, the Piece de Resistance was riding the rolling terrain of "The Meadows" at the base area, the only place we've ever been where dirt singletrack meanders through trees alongside a golf course. It was pretty cool. Hunger set in quickly after nearly three hours of pedaling in drizzly 40-something degree weather. So, after loading the bikes and grabbing our bags with dry clothes, we headed into Osprey Meadows Lodge in hopes of cleaning up and eating. Kenny the Concierge hooked us up with free passes to their spa, sans massage but still stylin' (were we really that smooth, or just that dirty?). We also got a bonus tour of some rooms plus dinner arrangements. We were set...and thank you, Kenny. 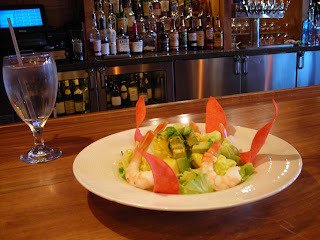 A four-star shrimp salad (plus soup & sandwiches) and very content conversation capped the day. 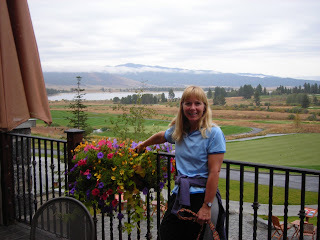 I was looking for blogs about the Tamarack Resort to share on our site and I came across your post...If you're open to it, shoot me an email at jane(at)dwellable(dot)com.